← Trolli’s Halloween Sour Brite Crawlers and Mummies Gummi Candy! Charms Halloween Pumpkin Pops from the 1950’s and Today! We’re going all the way back to the 1950’s for today’s post and a look at a Halloween treat that has been enjoyed by generations of kids. 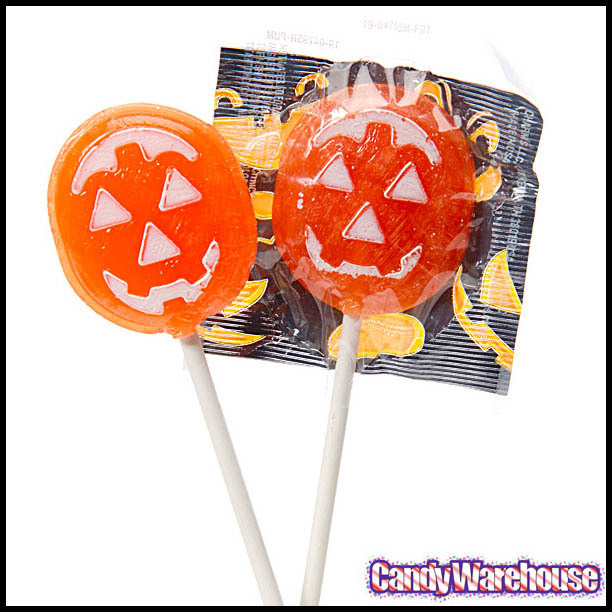 So make the jump to check out Charms Halloween Pumpkin Pops from the 1950’s and today! More than just the candy illustrations and information it contains, I completely dig the Halloween graphic touches down either side of this sales flyer. Such awesome vintage-Halloween goodness. I mentioned that that flyer is from the 1950’s, though it could go back a little earlier to the 1940’s. [Edit: I went back and was able to firmly date this piece based on other parts of the packet it came from – 1948.] 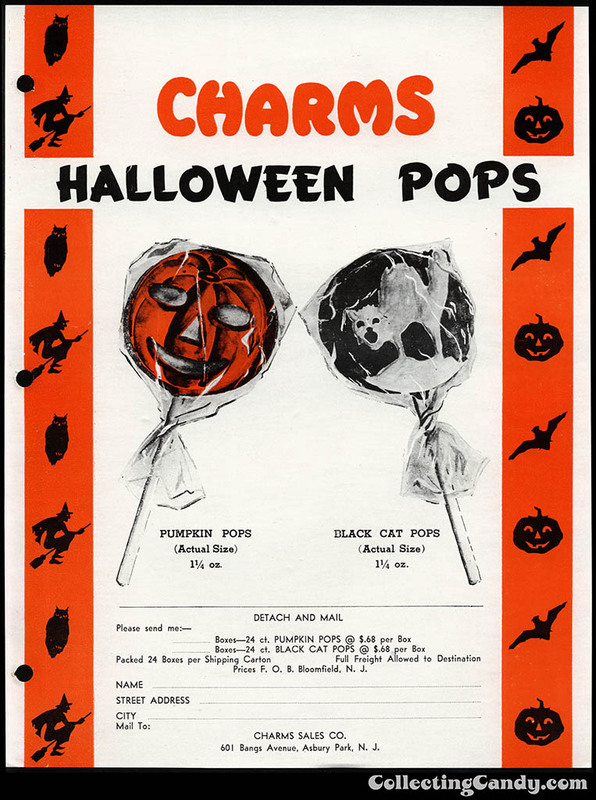 This sales sheet is a great record of an early example of Charms Pumpkin Pops along with that awfully cool-looking black cat pop. These new Pumpkin Pops are available again this year. 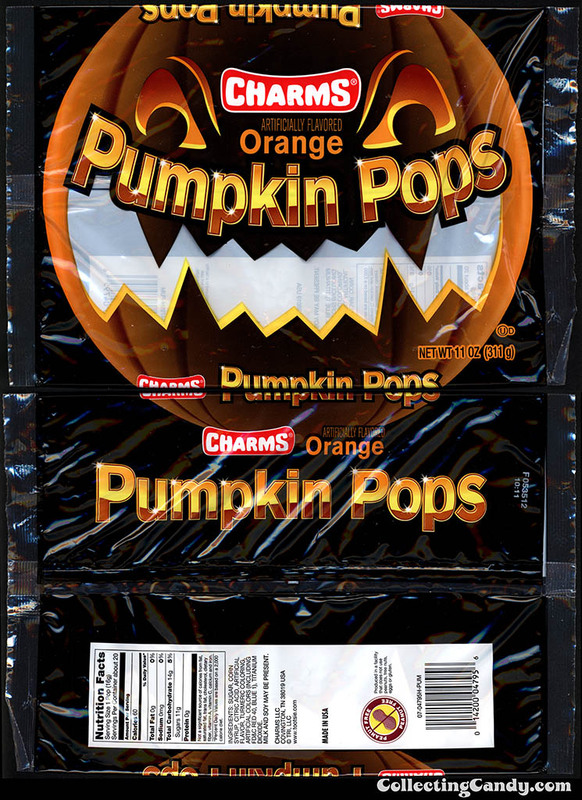 Though they are not exactly the same as the Charms Pumpkin Pops from half-a-century ago, I’d like to think there is a direct lineage from one to the other. I didn’t snap any photos of the modern pops that package contained but I did find a good one on the CandyWarehouse.com order site. Pretty great to see how such a simple confectionery offering has subtly evolved and withstood the test of time. I think it’s fun to compare and contrast the two. And that’s everything for today’s look back into Halloween candy’s past! See you next time! 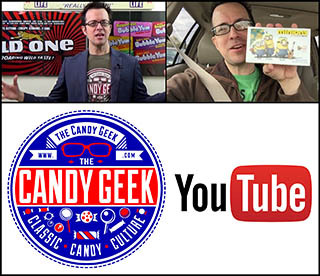 Today’s post has been part of CollectingCandy.com’s 2014 Countdown to Halloween. To check out other sites celebrating Halloween all month long, visit the official CountdownToHalloween site. For more of CollectingCandy.com’s CountdownToHalloween posts, just click here. This entry was posted in 1950's, CountdownToHalloween, Halloween, Holiday and tagged 1950's, 50's, candy collecting, candy collection, candy collector, candy wrapper collection, candy wrapper collector, Charms, collectible, collecting candy, confectionery, confections, Halloween, lollipops, packaging, sweets, vintage candy wrapper, wrapper. Bookmark the permalink.